Apple TV gets cozy with Amazon Prime, so where does that leave Netflix? Netflix's massive lists of movies and TV shows could someday vanish, replaced by just a handful of precise recommendations. At least that's what Netflix chief product officer Neil Hunt hinted at during a talk at Internet Week in New York City. According to TechCrunch, Hunt envisions a menu with just three or four choices, driven by Netflix's recommendation algorithms. “Our vision is, you won’t see a grid and you won’t see a sea of titles,” Hunt said. That may sound a bit scary, given Netflix's reputation for bad recommendations. On the other hand, Netflix users like to admit that they spend more time looking for movies than actually watching them. There's clearly a problem to be solved here, provided Netflix can nail the recommendation angle. 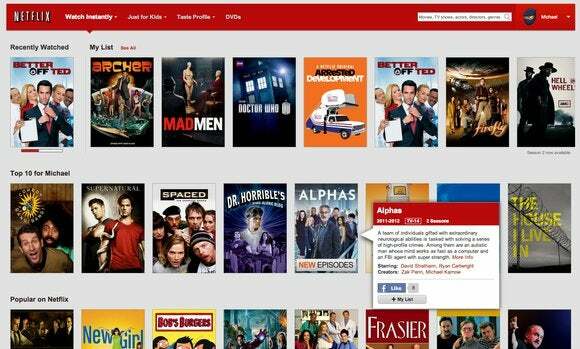 On that front, Netflix has made some efforts recently to steer users in the right direction. Last year, the company rolled out profiles so each family member could have individual recommendations, and replaced the manual Instant Queue with an automatic recommendation list. The emphasis with the streaming video service is clearly shifting toward telling users what to watch, rather than inundating them with choices, and the more people respond to those recommendations, the more data Netflix will have to work with. Eventually, Hunt sees Netflix breaking down the idea of channels, as the Internet will allow users to have their own individual feeds of things to watch. Netflix is hardly the only company chasing that vision. Recommendations play a big role in Amazon's Fire TV set-top box and may also be at the heart of Google's rumored Android TV revamp. Last August, Apple acquired Matcha for its supposedly superior recommendation system. Sooner or later, someone's going to get it right, and Netflix's channel-free future won't sound so crazy.